I’m always a sucker for a shiny red car, but I do love these old blues and greens. As of yesterday, my right eye is now sporting a snappy new lens. (Left eye is scheduled for Tuesday.) Since many of you are photographers or artists in another medium, I think you would find this whole light perception thing to be fascinating. If I use only my left eye, the world has a soft, yellowish tint, as though illuminated by an old-fashioned lightbulb. If I use only my new eye, yowzah! Now everything is brighter, with a clean blue-white glow, much like an iPad. As I review this post on the screen, there is a marked difference in how I perceive the shots, depending on which eye I use. A dense green canopy filters the sunlight, green plants are working hard to reclaim these wrecks and, for a photographic trifecta, what is left of the paint job on the Pontiac is green as well. 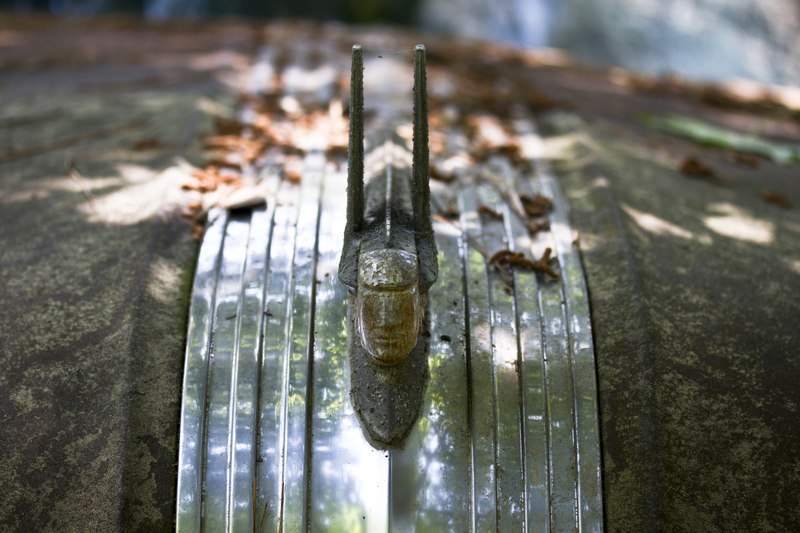 I love this part: you can see the leafy growth on the driver’s side fender. Those same leaves are mirrored, but as shadow-shapes on the passenger’s side. Nice touch, Mother Nature. Nice touch. Most of these closeups or macros don’t do well as thumbnails. If you can, view on a full screen. 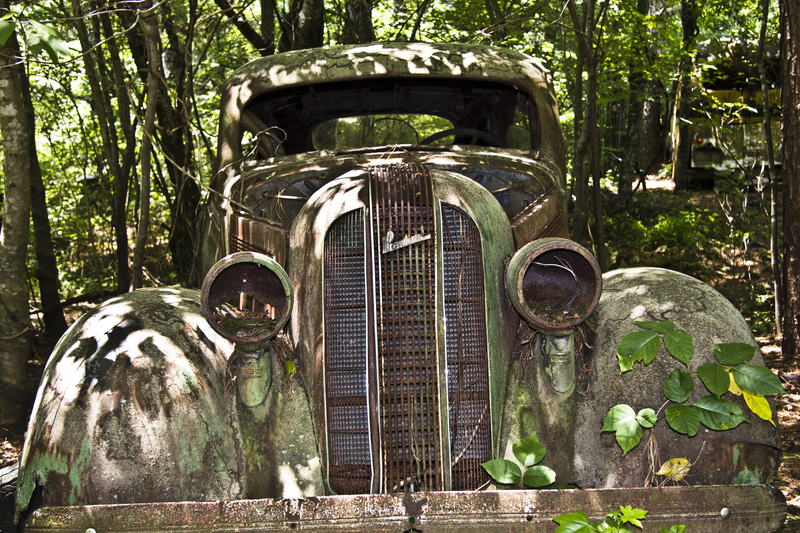 In addition to the cars and the rust, I really enjoyed shooting here because of the tree cover. As bright (and hot) as the day was, there was plenty of shade to be found. (And if there was no shade, I just shot elsewhere on the grounds.) The results? A very noticeable tendency for green backgrounds and dappled sunlight. And I’m pleased on both counts. Call them hood ornaments or car mascots, radiator caps or bonnet ornaments, they’re car jewelry to me. They began as radiator caps. 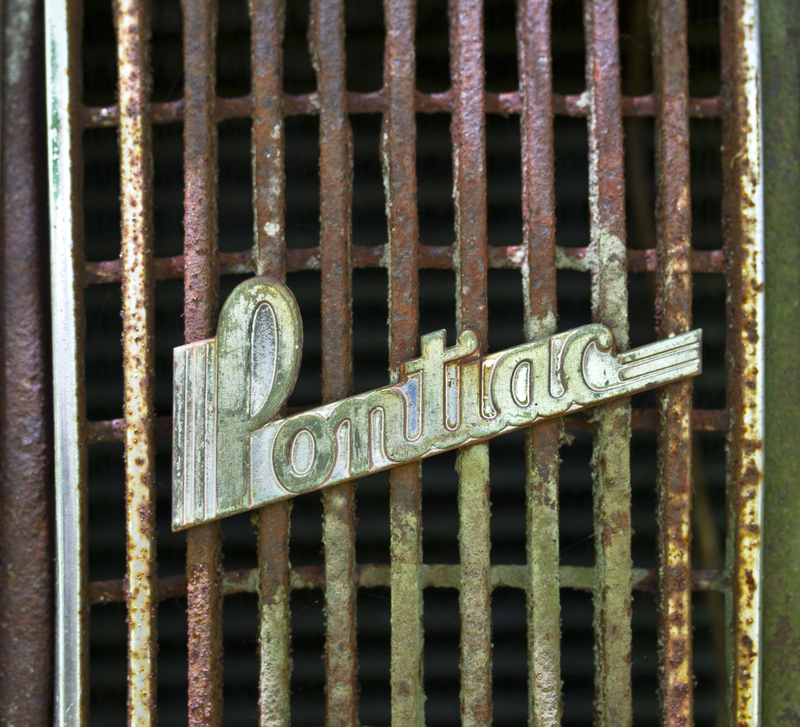 (Make a picture in your head: radiators used to be outside, on the front of cars.) By the early 60’s, hood ornaments were on their way out, generally due to laws that regulated their sizes or even whether cars could have them and that was predicated on concerns for pedestrian safety. Too bad. I find that many of these add a real touch of beauty to the machines they grace.